Check out this baby! Lots of roof, lots of gable. She steps right forwards and drops down to the entrance. Look at the outside and you can almost see the entrance hall – under the lamp, press on the oak, through the big door frame and you are in the space between the structural wall seen upstairs and the thick wall with the fireplace making up the living room. Your very own baronial hall on a tiny scale. Bet the stairs are nice too. With Arts and Crafts everything needs to have character and be part of a romantic story. Look at the tiny windows below the big eaves to the right. Says hallway to me. Look at the windows on the end gable. 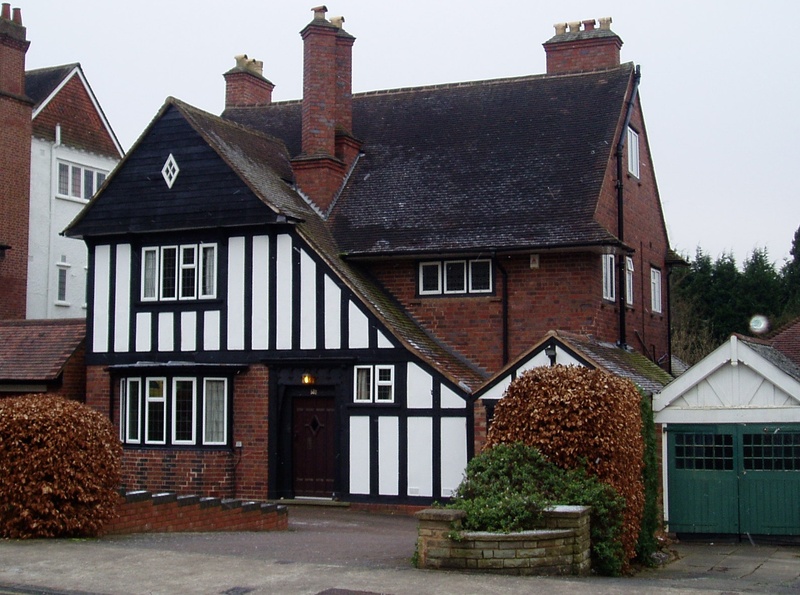 That loft room surely has exposed beams like Anne Hathaway’s cottage. What about the diamond in the top of the street front gable. If there’s a room for writing a secret letter you have just found it. Now get on the horse and ride like the wind! 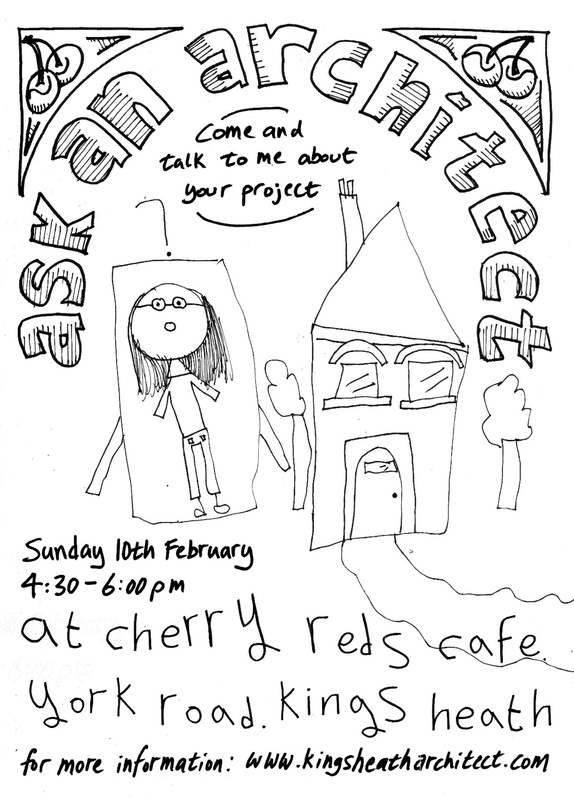 The next ask an architect will be on the 10th of February from 4:30 onwards – just come along and we can talk about your project over a really great cup of coffee. The beer is pretty good too actually. If you want to ask me something this month at another time, use the contact form on my get in touch page – we can still go for coffee. Sad to say, but my old tape died on me – it no longer rewinds. I have a new one thanks to Toolman in Yardley – cheaper than the internet by the way. 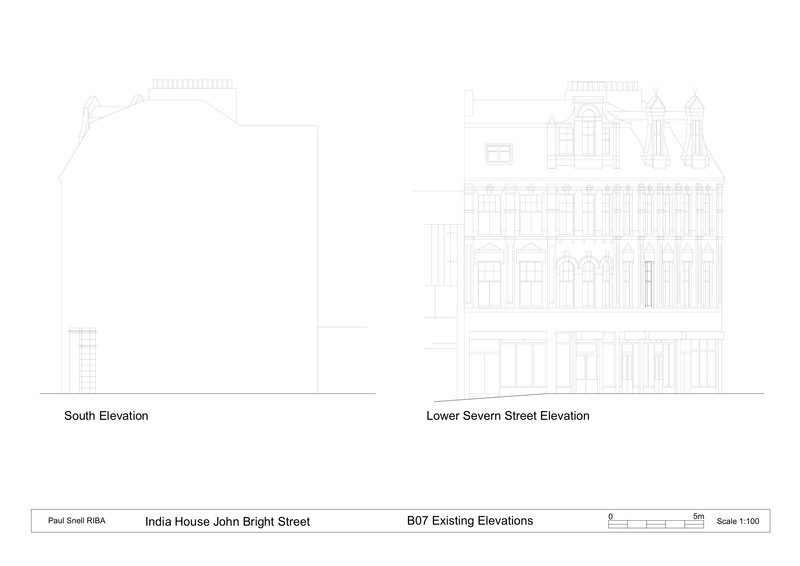 Elevations for my survey drawings, take a look. 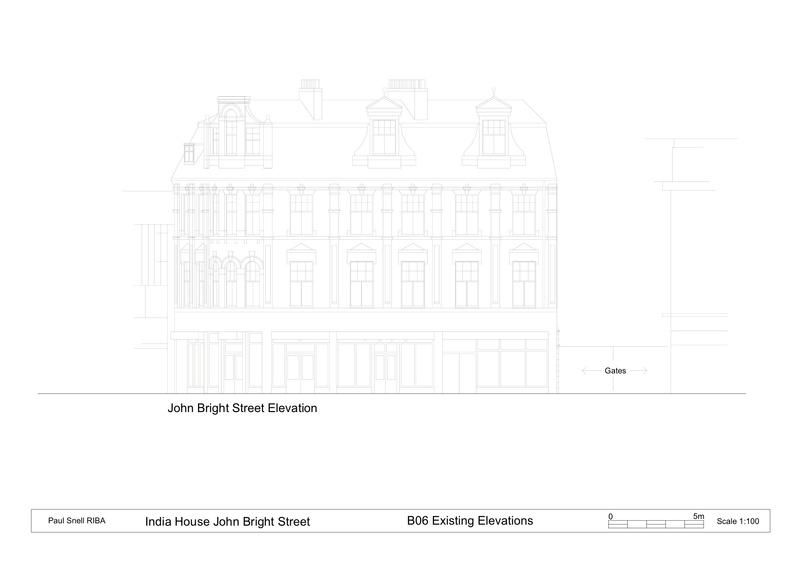 Because the building is on an angle we get a three quarter view down the side, plus the feature corner is on a radius, this means that all that Victorian awesomeness is seen in semi profile. Indicating these details, especially the mouldings and keystones, on CAD can be a little misleading. CAD doesn’t follow the eye in drawing, it follows the number. This can mean that the mouldings look deeper or shallower than they are – but wait, when they are drawn face on they are not exact either. Drawing at a scale like 1 to 100 it’s impossible to show what the stone details are exactly, the lines would be too dense to read and they would make the detail areas heavier in tone than the outlines with deeper returns, like the window openings. In fact the precision of the lines – their straightness and even weight, the way the line corners meet – gives a false impression to the reader of accuracy where there is in fact just a summary of what is there in the flesh. In a ruled ink study different pen weights would indicate depth and significance where appropriate and the finest details would call for the lightest lines. In CAD these touches are hard to make because of the mediated nature of the process and the limited choices in pen weight. We draw on the screen, we are surprised by the print. When working on the paper or film directly the work has more of a correct impression, especially working freehand. Plus it’s quicker. But people think it’s less accurate. Less accurate than what? Look again, what do you see? That’s no building, that is white with black lines. There are no materials, no shadows, no rain, no perspective. The drawings are attractive because they are complex and we admire the effort that went into them. But it’s not even a building. If you ever see the drawing package from an engineer they can be pretty dry. I would like to say that they contain more mistakes than my work, but hey. One thing they are though is correctly elevational. That is they show what is seen truly face on as if we have a section just in front of the elements represented. This means that they are dimensional representations. 8.6 metres is 8.6 metres drawn to scale on the elevation. If the building is like this one, the side that returns (goes around the corner) would not be shown. I’m sure the Victorians had engineers. And architects too. But what did their drawings look like? Pencil, ink and watercolour wash for the elevations, pastels or oil or watercolour for the perspectives. Plans and sections pencil and ink. Some of the most impressive drawings are the old stone mason drawings, full size or 1/2 or 1/3rd, mixing elevational accuracy and tone work to express the curving profiles. Every drawing should have a reason. This one is for the planners, change of use. Enjoy! Happy new year everyone! At last the kids are back in school so it’s back to work for me – although I have been busy busy over the holiday. The kitchen table is all mine now. A big thank you to all my lovely clients of 2012 and here’s to my wonderful clients of 2013.